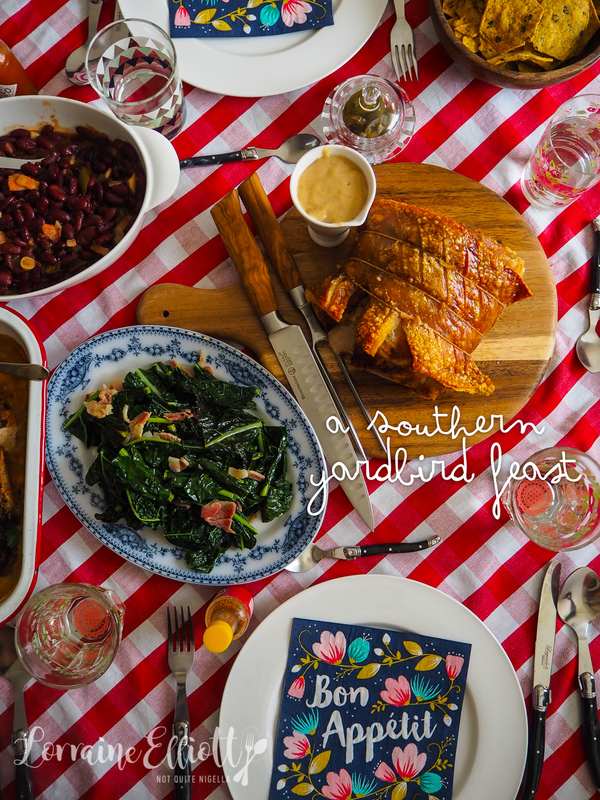 A Southern American Smothered Yardbird Feast! Hey ya'll, today we are visiting the South of America! 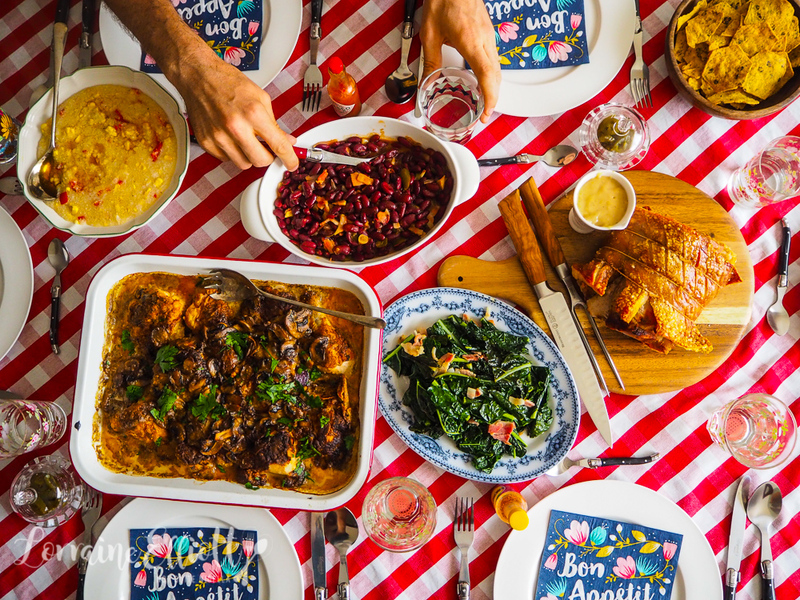 I invited friends over to try some of the foods inspired by my recent trip to the South. 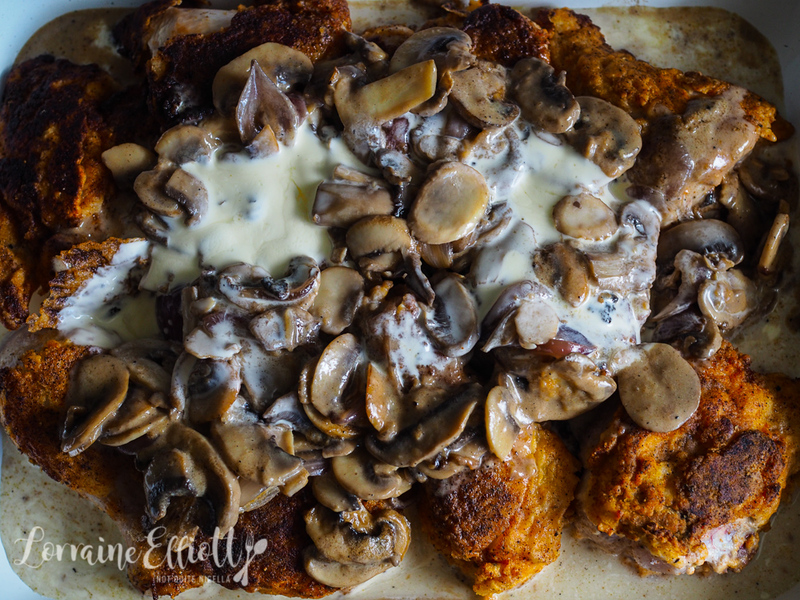 We start with Smothered Yardbird - pieces of fried chicken sitting atop a bed of crispy potatoes and smothered with a rich and creamy mushroom gravy. If that doesn't get you drooling how about a rolled pork loin with red eye gravy (made with roast pork pan juices and coffee). 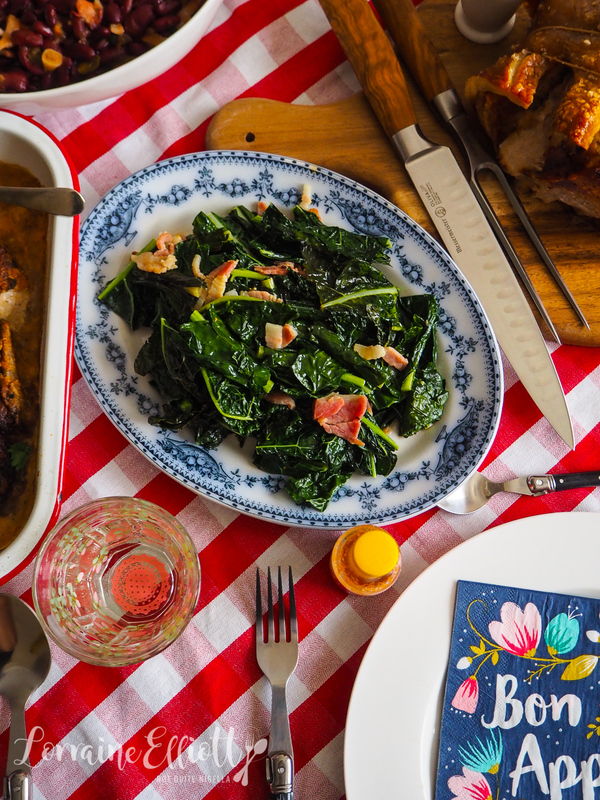 To complement these dishes were sides of tangy, sweet "All Day" red beans, grilled corn grits with browned butter and sauteed greens with bacon! Whenever I come back from a destination I'm inspired too make food from it. This is to recreate the tastes and smells from where I've eaten, and hopefully this gives rise to memories of the sounds and the personalities that I've met along the way. While I was in Texas I picked up a cookbook, a spiral bound number called "How To Win A Cowboy's Heart Cookbook" by Kathy Lynn Wills. Although I'm not looking to do exactly that, when I flicked through it I fell in love with the names and ideas for Southern recipes. It goes without saying that Americans are different from Australians, and even Southern Americans are different from those up North. I did wonder what on earth possessed me to invite Southerners Ivy and Ryan over for a Southern feast knowing that I have no Southern heritage, only a fascination with the cuisine. But the thing about Southerners is that they're polite and even if the food or company is terrible, they'll never tell you it is. I had intended just to make smothered yardbird and some sides. I was drawn to the recipe purely based on the name. It came from a time and place where you'd have chickens in your yard. Alas I've never lived this existence so it technically wasn't a yardbird but a regular chicken bought from a butcher. In the recipe they use a tin of cream of mushroom soup and a tin of cream of chicken soup. I didn't want to use tinned soup so I made up my own cream of mushroom soup. 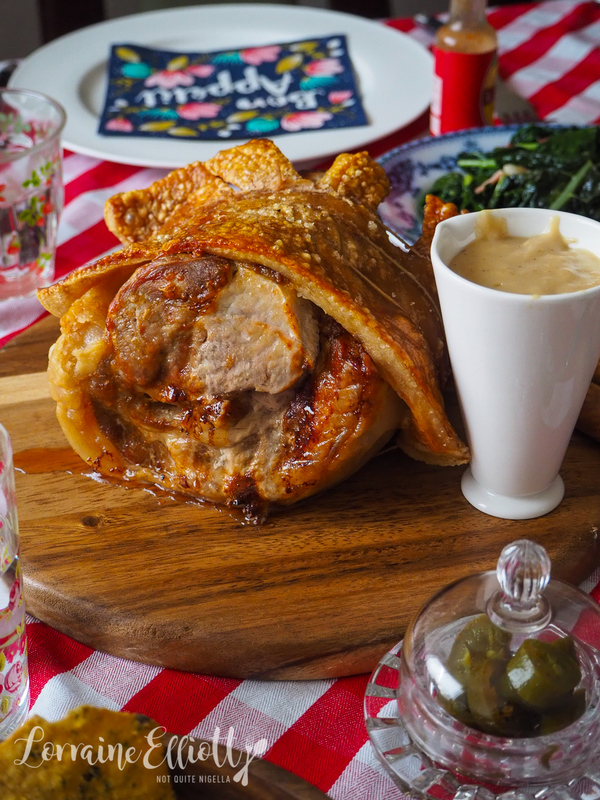 I took some liberties with the pork too - usually red eye gravy is served with pan fried ham steaks but I think Australians might like the idea of a rolled pork loin with crackling (although of course it's up to you, ham steaks are infinitely easier). 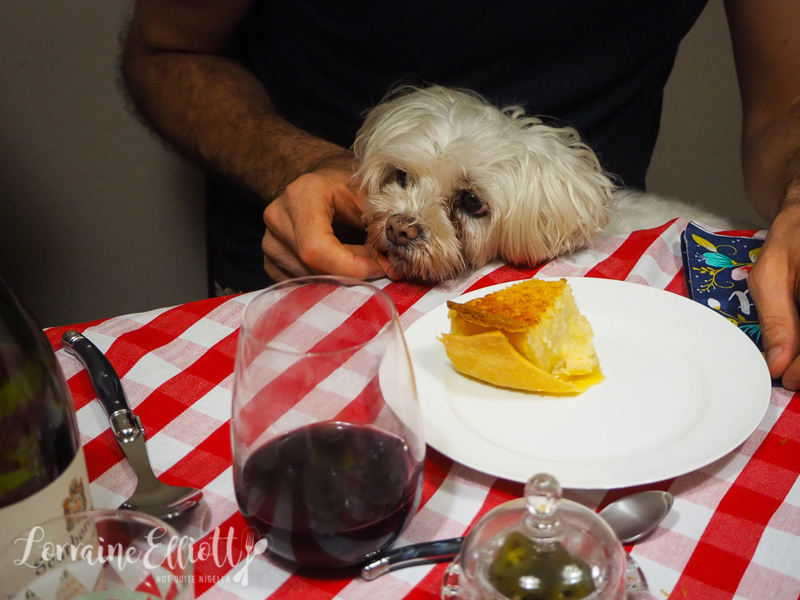 Because collard greens are impossible to find here (the ones at Marrickville Organic market are apparently not real collard greens according to Ivy) I subbed Tuscan cabbage which is not an exact substitute but close-ish enough. The grits were given a different treatment from traditional cheese grits. Instead I cooked them with chicken stock and corn and finished them with cream and browned butter (clearly diet food) and they were a big hit (I say that with some surprise as I was convinced that I had screwed them up until the cream and browned butter went in). And just for contrast were the slow cooked kidney beans that were tangy and slightly sweet. While cooking the food I kept trying to quash my Australianism by adding all sorts of exotic spices and flavours and instead I kept it simple. If there is one thing this cowboy cookbook taught me it's that salt and pepper are the main spices and parsley may possibly get a look in sometimes (usually dried). But even without the additions the food smelled and tasted incredible (that sounds immodest, but really it's a tribute to the Southern style of cooking). "Make MORE ice!" I said to Mr NQN, "We've got Americans coming over!" (have you ever bought a cold drink in America? ;) ). We put on an American music playlist and Ivy and Ryan showed up exactly on time (while I was still curling my hair, you know the Southern term "The higher the hair, the closer to god"?, I love themes). They were kind enough to bring a gift - a gorgeous Lodge cast iron pan that I had coveted. Louise and Viggo showed up with 4 month old baby Henry and two pies shortly after. As we sat down to dinner Ryan said that for it to be a true Southern meal we had to start with saying grace. Ivy remarked while eating it that it was a true Southern meal and even looked like it too because on the plate everything was all mixed up together and mingling. Baby Henry behaved himself very well and I gave him a soft toy lobster which they named "Lorraine the lobster". Talk turned to Fergie's strange version of the Star Spangled Banner which Ryan hadn't seen so we played it for him. He then requested that we play Whitney's version to cleanse things in the same way that a sorbet would. For dessert were Louise's pies-two because why have one pie when you can have two? 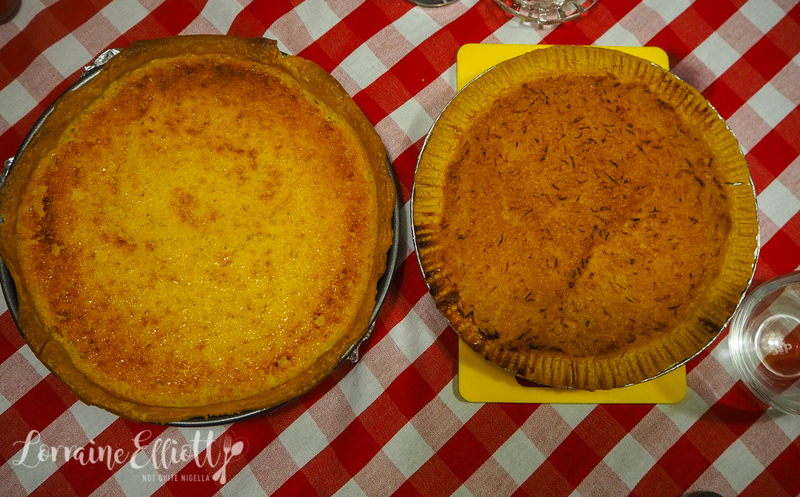 There was a buttermilk pie and a lemon chess pie. And how do you squirt your redi whip? Rorschach cream testing. 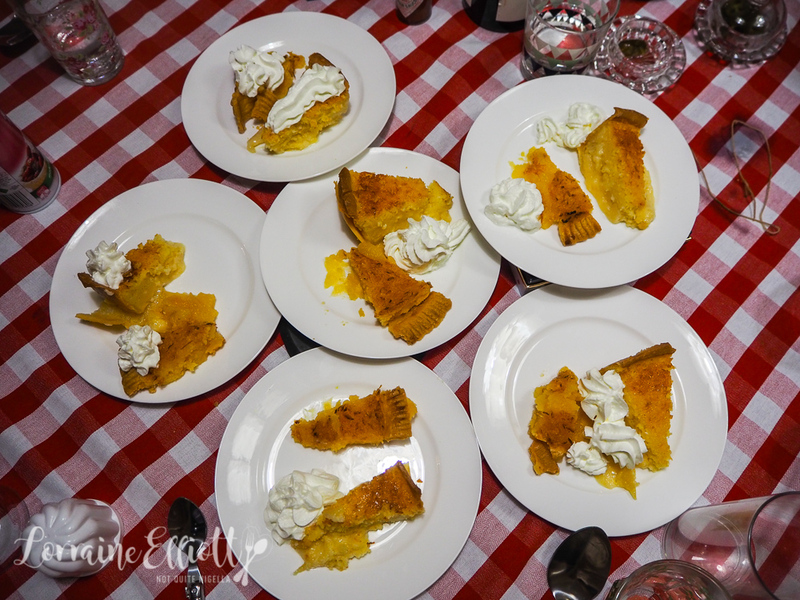 They were both great but I have a special love for custard pies and for me the buttermilk pie slightly pipped the chess pie but I'd throw neither out of bed. 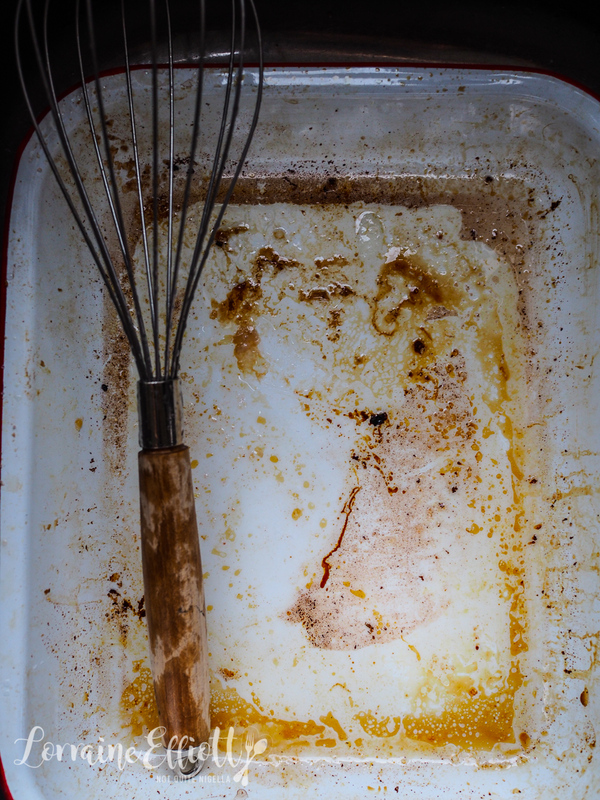 We debated how people squirted their redi whip and treated it like a Rorschach test. The pies were served with chocolate truffles and sweet tea gummy bears. Then Louise and Viggo had to leave to put little Henry to sleep but Ivy and Ryan stayed on to play Madlibs, a game I had picked up from the same store as the cowboy cookbook. "I don't believe I got a slice of pie..."
So tell me Dear Reader, have you ever played Madlibs? And do you have a favourite Southern dish? Which dish appealed to you the most? 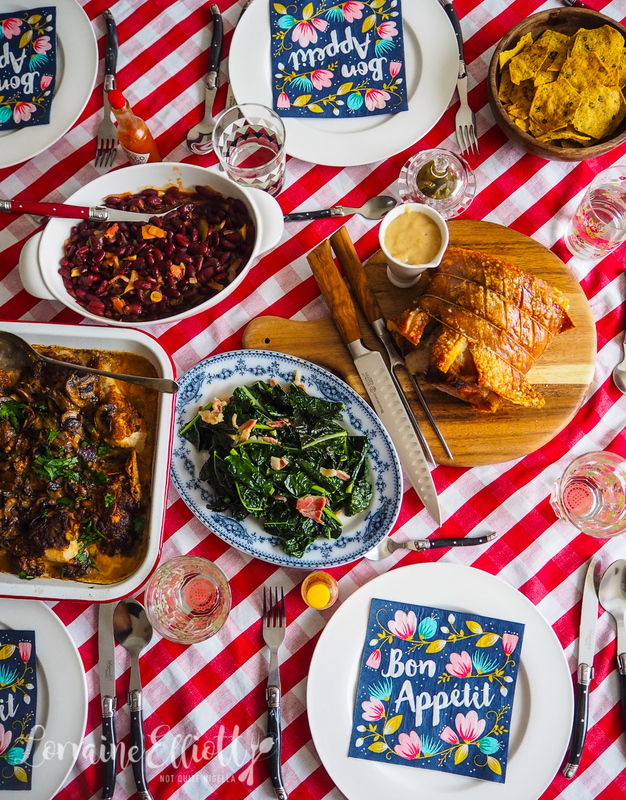 And how often do you have people over for dinner? Step 1 - Preheat oven to 150C/300F. 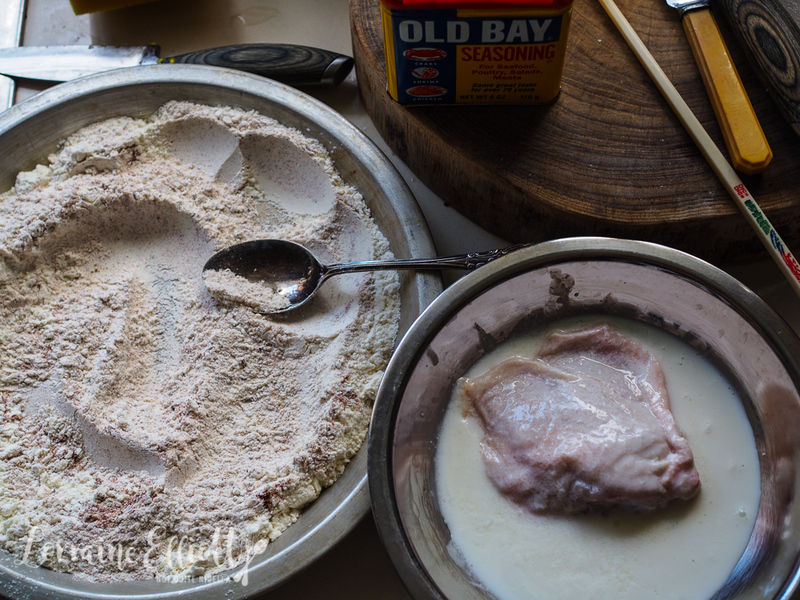 Mix the flour with the salt, pepper, onion powder, garlic powder, Old Bay and paprika until combined and place in a shallow bowl. Heat oil in a frypan and dip the chicken pieces in the buttermilk and then the flour mixture (don't discard the flour mixture). Fry until golden brown in two batches and then place on a tray. 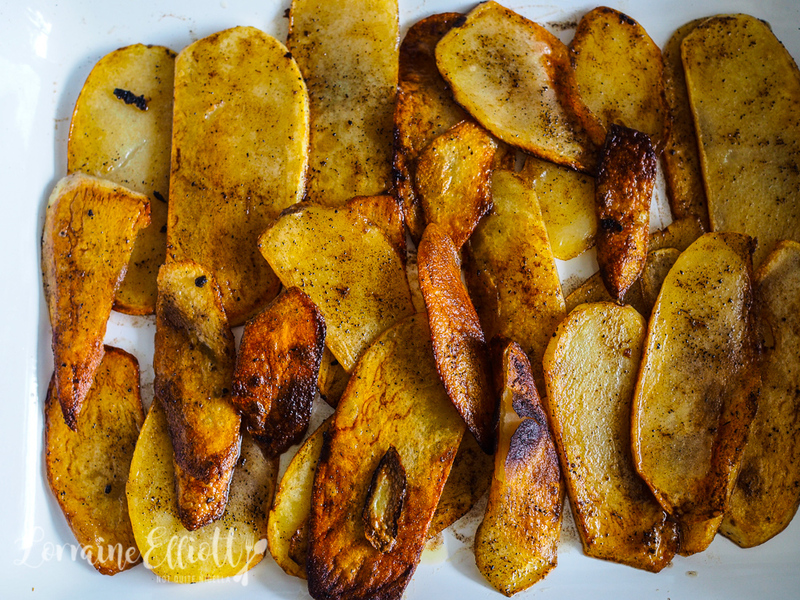 Then fry the potatoes until golden on the outside (although you don't have to make sure that they are cooked all the way through as they'll cook in the oven). 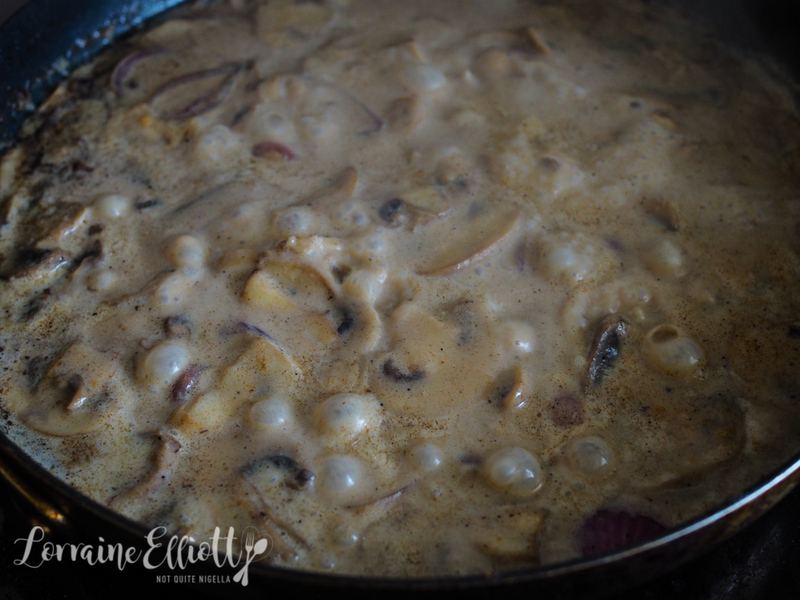 Step 2 - Add a little more oil and fry the onions until translucent and then add the mushrooms and saute until browned. Add 1 cup of stock, half a cup of cream and milk and reduce until you get a creamy sauce. Add salt and pepper to taste. You can make these with pork chops or ham steaks but really why would you pass up the chance to get crunchy crackling? Step 1 - The day before I make this I like to leave the crackling part uncovered in the fridge so that it dries out to get some crispy crackling. Preheat oven to 220C/440F. 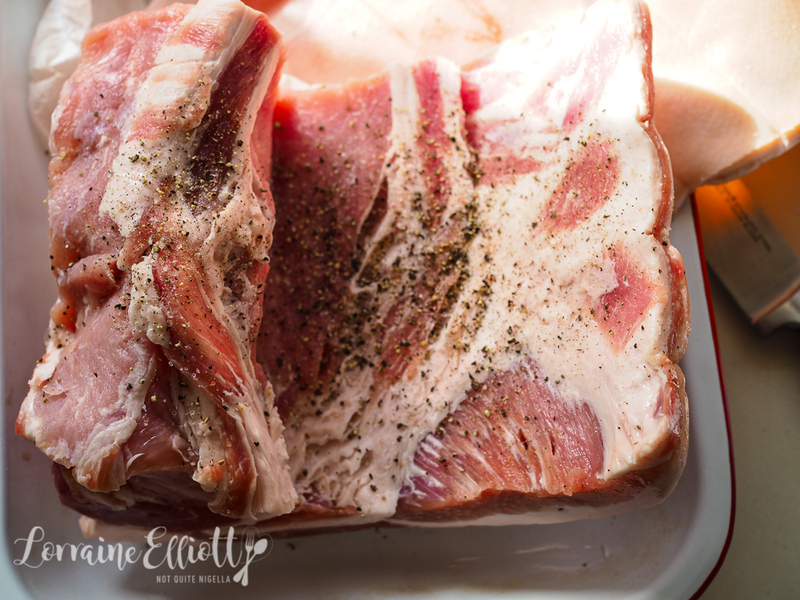 Unroll the pork loin and season with salt and pepper inside (you may need to cut the meat so that you get the seasoning a bit further in) and then roll it back up and tie with string. Place on a roasting tray and roast for 30 minutes. Then turn heat down to 180C/350F and roast for 45 minutes. If the pork crackling hasn't become blistered by now, turn the heat up to 250C/482F and roast for 10-15 minutes or until blistered. Cover with foil. Step 2 - Take 3 tablespoons of the pork fat from the roasting tray and place in a small saucepan. Heat and then add the flour and stir to combine and cook for 30 seconds or so. Add the coffee and chicken stock whisking at the same time. Add sugar and cream and then season with salt and pepper to taste. Serve with slices of the pork. Full disclosure Dear Reader, I did not let these go all day as I was having an exceedingly busy weekend. 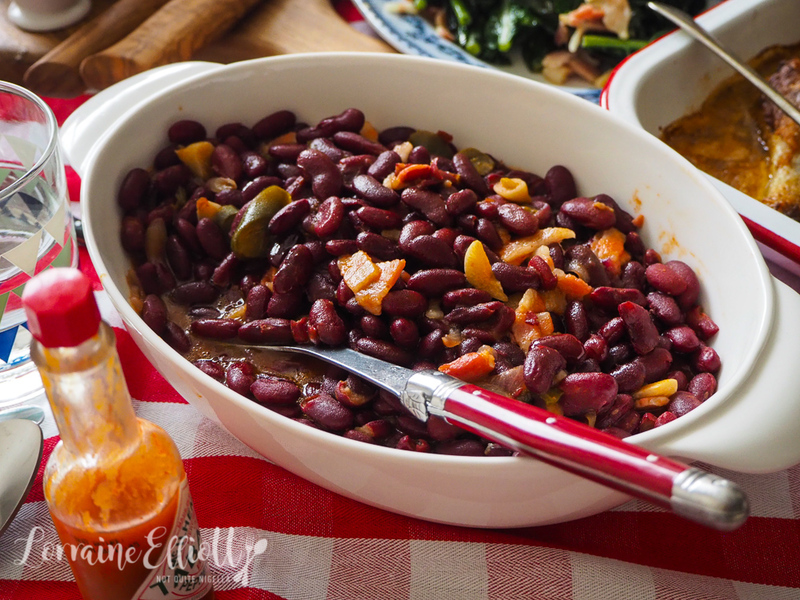 I used tinned kidney beans because I only started cooking everything for dinner after 3pm and guests were arriving at 7pm (honestly this was one of the easiest dinner parties to do). Because this meal is so rich, these tangy beans provided a much needed counterpoint to all of the butter. Step 1 - Fry the onion and garlic in a couple of tablespoons of fat or oil (I actually used some of the fat from the roast pork). Add the beans, chicken stock, tomato sauce, jalapenos and sugar and bring to a boil. Simmer on low to medium heat with the lid on for around 30 minutes making sure to check that the beans don't stick to the bottom of the pot. Take the lid off to reduce the sauce and then season with salt and pepper. 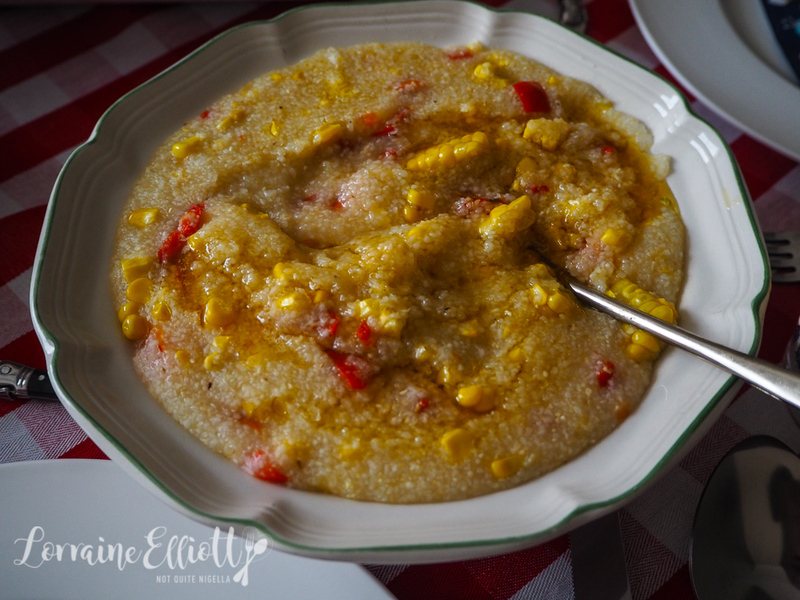 Nobody really knows what grits are (only kidding, it's hominy or coarsely ground maize kernels) and the closest comparison I can make is polenta, a relatively mild tasting item that you can mix with liquid and add flavour to. Southeners often eat cheese grits for breakfast. I've got nothing against cheese but I was inspired to try this with corn and browned butter based on a restaurant dish I tried. And blow me over with a feather but they were just so gosh darn popular. Step 1 - Heat the butter in a heavy bottomed saucepan on medium to medium to high heat until it smells nutty and the top is foamy. Carefully pour into a ceramic bowl and set aside. Fry the capsicum in a tablespoon of the browned butter until soft. Step 2 - Add the chicken stock to the pot and then pour in the grits in a thin stream and stir. These were instant grits so they didn't take long and I just stirred them with a flat bottomed wooden spoon to make sure it didn't catch on the bottom of the pan. Once it starts to really thicken add in the corn kernels and then season with salt and pepper. 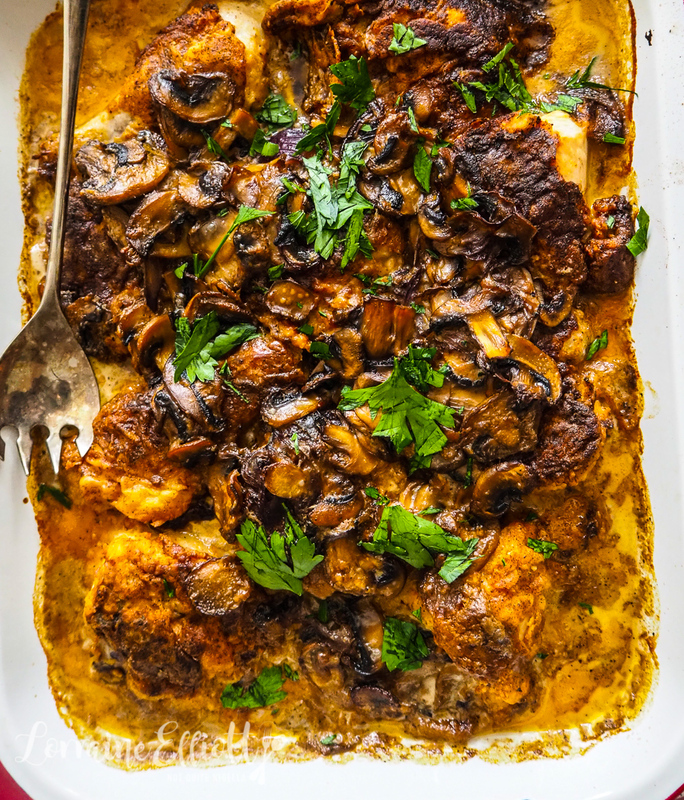 When you're ready to serve it or when it gets really thick, add the cream and browned butter. 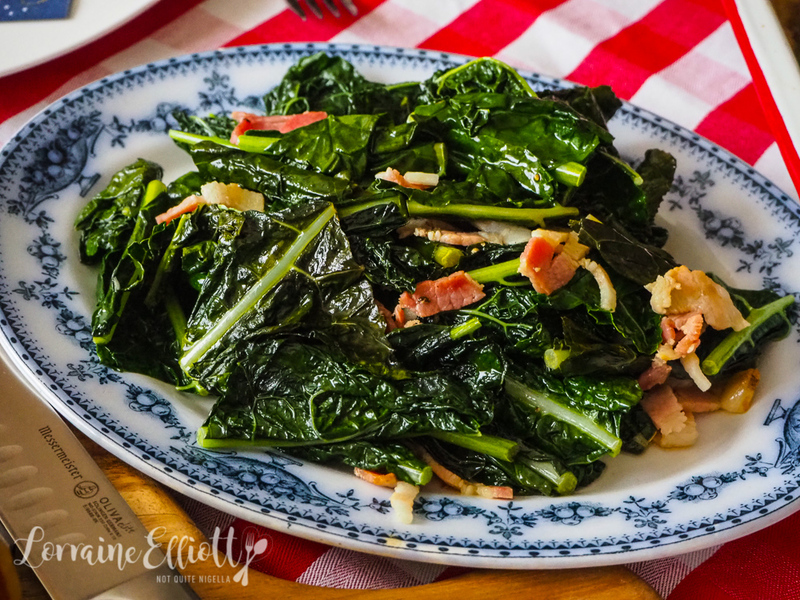 You can use a range of greens in place of collard greens. It is really a matter of sauteeing them with some garlic and bacon until they are wilted and soft. Chicken stock, a must it seems, almost steams the greens so that they are soft but not oily. Step 1 - Heat oil in a large skillet or frypan and add the bacon fry for a couple of minutes. Then cook the garlic for minute before adding in the greens. They will wilt down a lot so if you add them in 2-3 lots they should fit. Add the chicken stock and place the lid on the pan and allow the greens to wilt, opening up and stirring occasionally. recipeEasy Asian Flavoured Chicken & Pork Meatball Subs!